We live in a modern day entrepôt: goods come, and goods go. But what’s actually produced? Beyond the traditional hewing of weed and canning of fish, local production leans heavily towards the strictly ephemeral: generic cityscapes for the Hollywood dream factory and fashion concepts like wearing yoga pants in all possible social circumstances. That the local development sector is a close relative of all these industries is reflected in its shared characteristics: tightly packaged, paper-thin, unsightly of appearance, and hallucinogenic. But it’s the high-functioning, high value-add sibling. Mountain and water glimpses and/or aspirational lifestyles are neatly presented; parcels of air are retailed with all the panache and skill of a midway barker; a network of contractors quickly assembles the product, deftly hiding defects beneath granite countertops and stainless steel refrigerators. An ancillary phalanx of realtors and home stagers stand ready to facilitate the optional flip. This well-honed flexible manufacturing network has outgrown its mountain, water and border constrained host and has itself become a product for export. The utopian model is promulgated by Larry Beasley O.C. and his coven of former city planners. From Dallas to Abu Dhabi they conjure organic geographies through community input, mixed-use designs and generous applications of the high-density-mid-size-tower-on-a-townhouse-podium-with-public-amenity trope. But there’s a dystopian version, too. One manifestation has spontaneous erupted, like a weed, as Beijing’s Vancouver Forest. It’s also evident in the “Vancouverization” of Toronto. Bosa, Concorde Pacific, Westbank, Concert, and Onni have all invaded Hogtown, gobbling HAM (Hot Asian Money) and TO’s penchant for inhuman scale to produce giant towers on bloated podiums with unobstructed views of the Gardiner Expressway. Outside the core and transportation corridors, the door-to-door house hunter has arrived in spirit from the West Coast: couples walk up to every house in a neighbourhood and in person or by personal letter deposited in a mail box inquire as to the possibility of purchasing. 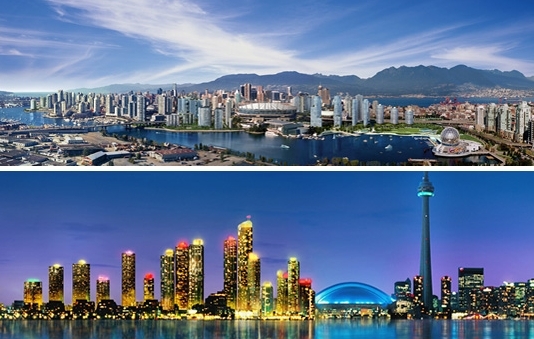 Savvy: as Vancouver’s market cools, Toronto’s heats up. This little niche on the coast has always endured an inferiority complex, one not entirely mitigated by the hosting of world expositions and international sporting events. But as the OECD, Bloomberg, The Economist, and others express concerns regarding a property value implosion and the associated impact it would have on the national economy, our long-awaited moment in the spotlight may not be far off.